Yes, I did. I took the photo when last in Santiago de Compostela, and when I viewed it I was struck by the mystery it contained. It seems to take you beyond and past the beautiful Portico de Gloria into the mysteries of the Cathedral in Santiago itself. It was the only photo I ever considered. The rest was easy. No, although I did have that option. Since I self-published with iUniverse, I had full control over the cover design, although I did pay for a "Cover Copy Polish" which I thought, on receipt, took a lot of the strength out of the book and the original copy. I requested that they go with the original cover, which they did. The first thing a pilgrim sees when they enter the cathedral is Master Matteo's stunning Portico de Gloria, described by some as a "symphony in stone". The Romanesque interior lies inside the Barroque exterior, but in some ways it is far more ornate than the original builders intended. As such, as I have explained, I felt that a mystery was implicit, and the perspective and symmetry of the cover invite the reader to find out more. The book itself is a "timeshift" of course which looks at a bishop named Priscillian. Decapitated in 385 by the Romans (and with the full encouragement of certain of the Iberian bishops, although some - notable St. Ambrose and St. Martin of Tours were very much against it - were so scandalised that they refused to hold communian with the Roman emperor who allowed it. My claim - and remember it is fictional after all - is that it is Priscillian in the tomb in the cathedral, and not St. James at all. All of this is dovetailed with the story of Miranda, a professor from the University of Toronto, who is walking the Camino to try to regain some self identity. Myself, but you'll see me listed as Cassie Berry. It's a bit of an in-joke actually. I hope she doesn't ask for a share of the royalities! If not, what would you change and why? Nothing. The colour. It has a "mediaeval" touch to it. As above, although it is also available at book outlets in Spain, and from Amazon etc., of course. 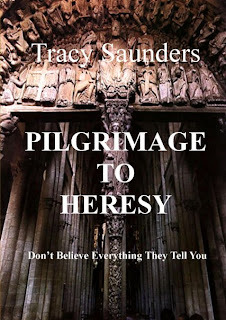 There are links on the websire, and it can also be found under "Pilgrimage to Heresy" on Google, etc. Please send me a copy of your cover along with your answers so the blog readers can see your cover and read your thoughts. Please see above, but, if the image is not clear, I have others.